The global diagnostic imaging market was valued at approximately US$ 28.5 Bn in 2017. 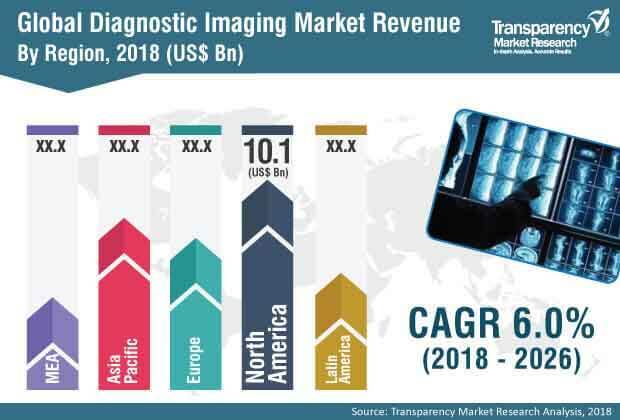 It is projected to expand at a compounded annual growth rate (CAGR) of more than 5.5% from 2018 to 2026, according to a new report published by Transparency Market Research (TMR) titled “Diagnostic Imaging Market – Global Industry Analysis, Size, Share, Growth, Trends, and Forecast, 2018–2026”. The report suggests that factors such as growing adoption of diagnostic imaging, rise in patient pool, increase in geriatric population, and rise in the demand for early diagnosis of diseases are likely to raise the demand for diagnostic imaging in the next few years. New product launches through advancements in technology and rising demand for diagnostic imaging among the rising geriatric population are expected to boost the market in North America and Europe during the forecast period. These regions are likely to account for a significant share of the global diagnostic imaging market during the forecast period. Increased government support and high rate of adoption of imaging devices are likely to boost the diagnostic imaging market in Asia Pacific from 2018 to 2026. Improvement in healthcare reforms in Japan, the U.S., China, and the U.K. has improved access to various diagnostic and treatment services, resulting in increased life-expectancy of the population in these countries. The global geriatric population is expected to increase rapidly in developed countries such as the U.S. and Japan. According to the U.S. Census Bureau, in 2009, around 13% of the country’s total population was older than 65 years, and is estimated to grow at a rate of 20% till 2030. According to figures published in the United Nations’ “World Population Prospects,” the global population of those aged 100 years and above would be considerably large by 2050, followed by the 85+ and 65+ age groups. Rise in the geriatric population is anticipated to boost the demand for healthcare products and services, since this population segment is highly prone to respiratory (tuberculosis and pneumonia), oral, orthopedic (osteoporosis), and cardiovascular diseases. Early diagnosis of these diseases is crucial for proper treatment. These diseases can be accurately diagnosed with the usage of medical imaging equipment such as X-ray, ultrasound, magnetic resonance imaging (MRI), and computed tomography (CT). Hence, the overall medical imaging equipment market is expected to be driven significantly owing to an aging global population. In terms of end-users, the diagnostic centers segment is expected to hold a prominent share, i.e. 49.8%, of the market share by 2026. This is attributable to all imaging facilities being readily available under one roof in diagnostic centers, as these centers are specially designed for diagnosis and the rising trend of recommending imaging procedures for quick and accurate diagnosis of diseases. Based on geography, the global microdermabrasion devices market has been divided into major five geographical regions: North America, Europe, Asia-Pacific, Latin America and Middle East & Africa. The market in Asia Pacific is projected to expand at a high growth rate (over 7.0%) during the forecast period, due to increasing health care expenditure and adoption of imaging technologies in the region. The market in the region is propelled by the increased government funding for health care and growing popularity of Asia Pacific as a destination for medical tourism. Prominent players operating in the global diagnostic imaging market are GE Healthcare, Koninklijke Philips N.V., Hologic, Inc., Siemens Healthcare GmBH, Fujifilm Corporation, Toshiba Medical Systems Corporation, Shimadzu Corporation, Carestream Health, Inc., Hitachi Ltd., and Samsung Medison. These companies are investing robustly in mergers and acquisitions in order to expand their reach and increase revenues. They are projected to maintain their lead position in the global diagnostic imaging market during the forecast period.